Download "S. ll. To improve cybersecurity in the United States through enhanced sharing of information about cybersecurity threats, and for other purposes." 1 BAG Discussion Draft S.L.C. 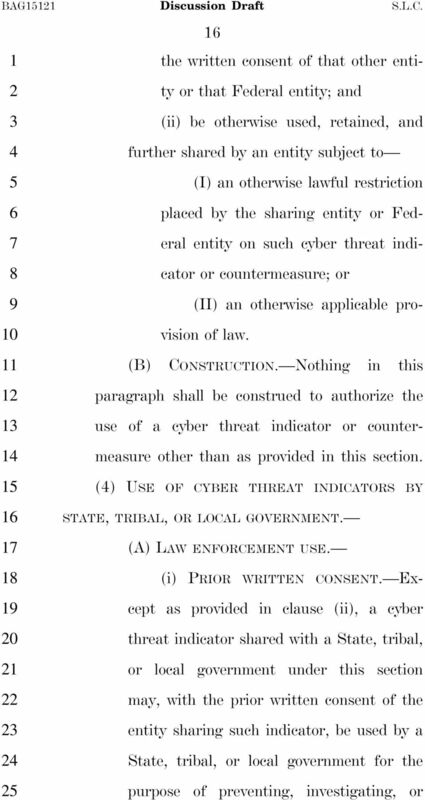 TH CONGRESS ST SESSION S. ll To improve cybersecurity in the United States through enhanced sharing of information about cybersecurity threats, and for other purposes. 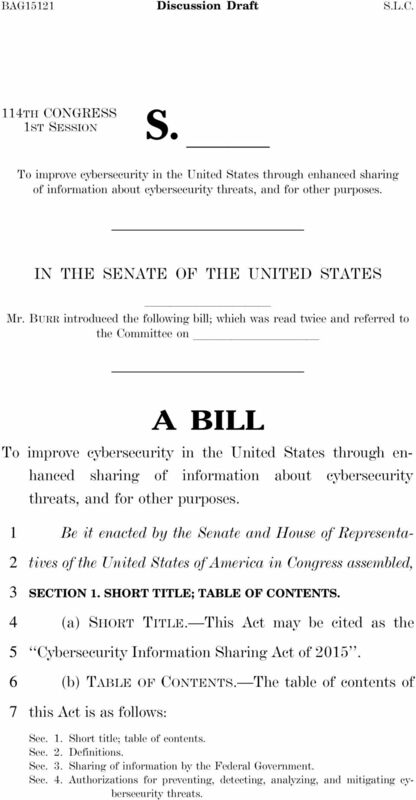 IN THE SENATE OF THE UNITED STATES llllllllll Mr. BURR introduced the following bill; which was read twice and referred to the Committee on llllllllll A BILL To improve cybersecurity in the United States through enhanced sharing of information about cybersecurity threats, and for other purposes. Be it enacted by the Senate and House of Representatives of the United States of America in Congress assembled, SECTION. SHORT TITLE; TABLE OF CONTENTS. (a) SHORT TITLE. 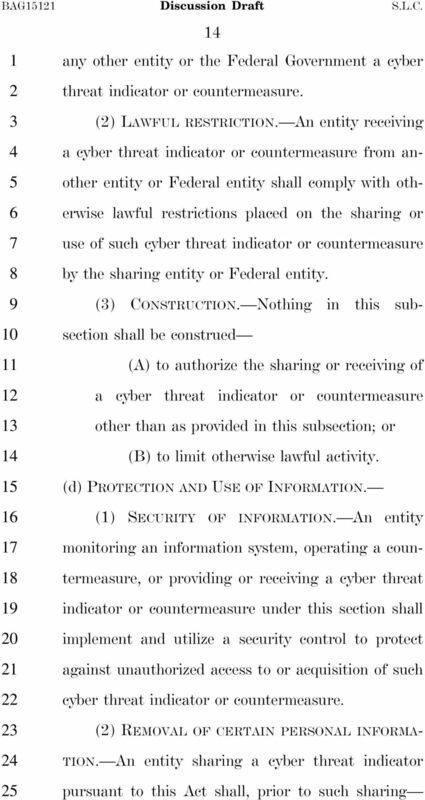 This Act may be cited as the Cybersecurity Information Sharing Act of 0. (b) TABLE OF CONTENTS. The table of contents of this Act is as follows: Sec.. Short title; table of contents. Sec.. Definitions. Sec.. Sharing of information by the Federal Government. Sec.. Authorizations for preventing, detecting, analyzing, and mitigating cybersecurity threats. 2 BAG Discussion Draft S.L.C. Sec.. Sharing of cyber threat indicators and countermeasures with the Federal Government. Sec.. Protection from liability. Sec.. Oversight of Government activities. 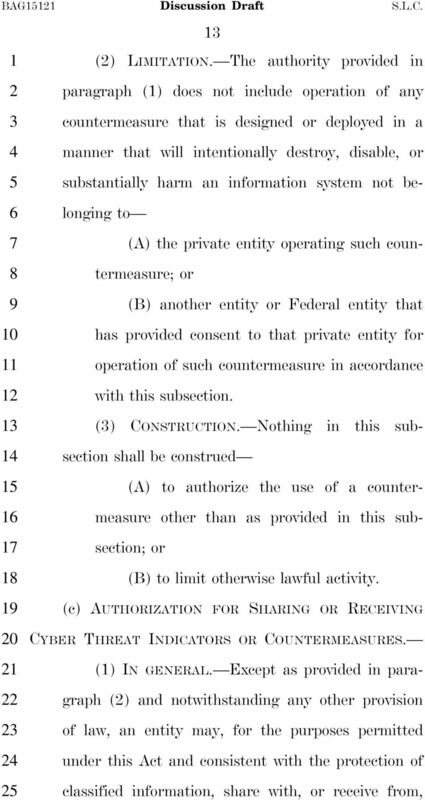 Sec.. Construction and preemption. Sec.. Report on cybersecurity threats. Sec. 0. Conforming amendments. 0 0 SEC.. DEFINITIONS. In this Act: () AGENCY. The term agency has the meaning given the term in section 0 of title, United States Code. () ANTITRUST LAWS. The term antitrust laws (A) has the meaning given the term in section of the Clayton Act ( U.S.C. ); (B) includes section of the Federal Trade Commission Act ( U.S.C. ) 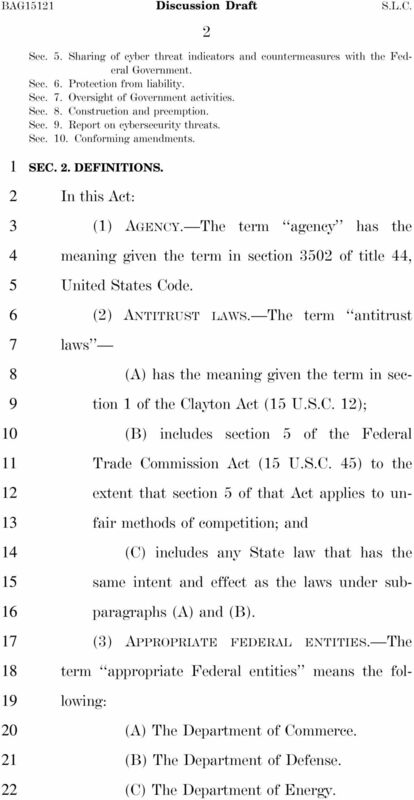 to the extent that section of that Act applies to unfair methods of competition; and (C) includes any State law that has the same intent and effect as the laws under subparagraphs (A) and (B). () APPROPRIATE FEDERAL ENTITIES. The term appropriate Federal entities means the following: (A) The Department of Commerce. (B) The Department of Defense. (C) The Department of Energy. 5 BAG Discussion Draft S.L.C. 0 0 (C) a security vulnerability, including anomalous activity that appears to indicate the existence of a security vulnerability; (D) a method of causing a user with legitimate access to an information system or information that is stored on, processed by, or transiting an information system to unwittingly enable the defeat of a security control or exploitation of a security vulnerability; (E) malicious cyber command and control; (F) the actual or potential harm caused by an incident, including information exfiltrated when it is necessary in order to describe a cybersecurity threat; (G) any other attribute of a cybersecurity threat, if disclosure of such attribute is not otherwise prohibited by law; or (H) any combination thereof. () ENTITY. (A) IN GENERAL. 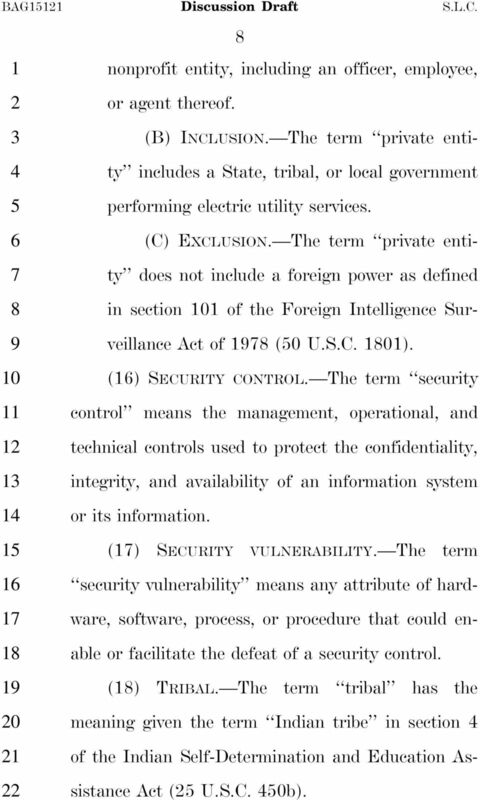 Except as otherwise provided in this paragraph, the term entity means any private entity, non-federal government agency or department, or State, tribal, or local government (including a political subdivision, department, or component thereof). 8 BAG Discussion Draft S.L.C. 0 0 nonprofit entity, including an officer, employee, or agent thereof. (B) INCLUSION. The term private entity includes a State, tribal, or local government performing electric utility services. (C) EXCLUSION. 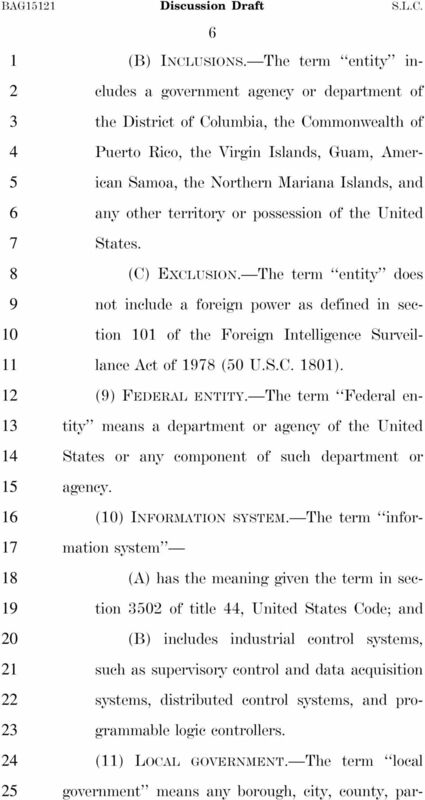 The term private entity does not include a foreign power as defined in section 0 of the Foreign Intelligence Surveillance Act of (0 U.S.C. 0). () SECURITY CONTROL. The term security control means the management, operational, and technical controls used to protect the confidentiality, integrity, and availability of an information system or its information. () SECURITY VULNERABILITY. The term security vulnerability means any attribute of hardware, software, process, or procedure that could enable or facilitate the defeat of a security control. () TRIBAL. The term tribal has the meaning given the term Indian tribe in section of the Indian Self-Determination and Education Assistance Act ( U.S.C. 0b). 11 BAG Discussion Draft S.L.C. 0 0 the sharing of cyber threat indicators by the Federal Government in a timely manner. (c) SUBMITTAL TO CONGRESS. 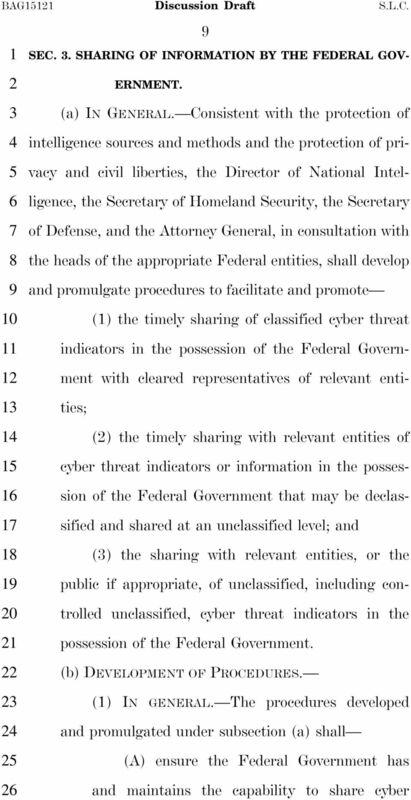 Not later than 0 days after the date of the enactment of this Act, the Director of National Intelligence, in consultation with the heads of the appropriate Federal entities, shall submit to Congress the procedures required by subsection (a). SEC.. AUTHORIZATIONS FOR PREVENTING, DETECTING, ANALYZING, AND MITIGATING CYBERSECU- RITY THREATS. 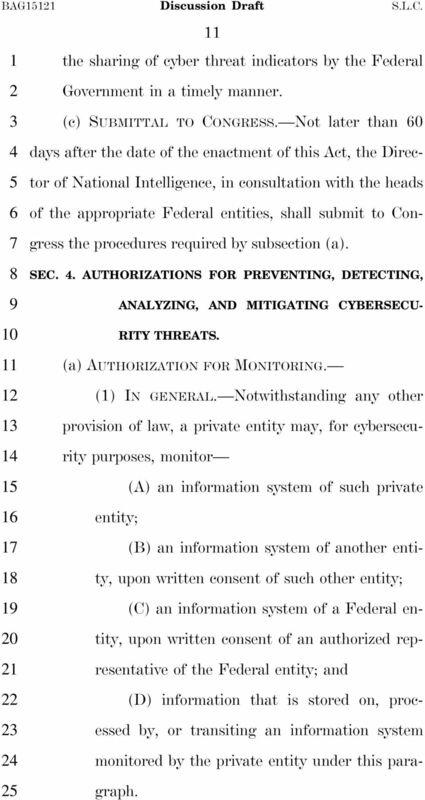 (a) AUTHORIZATION FOR MONITORING. () IN GENERAL. Notwithstanding any other provision of law, a private entity may, for cybersecurity purposes, monitor (A) an information system of such private entity; (B) an information system of another entity, upon written consent of such other entity; (C) an information system of a Federal entity, upon written consent of an authorized representative of the Federal entity; and (D) information that is stored on, processed by, or transiting an information system monitored by the private entity under this paragraph. 12 BAG Discussion Draft S.L.C. 0 0 () CONSTRUCTION. 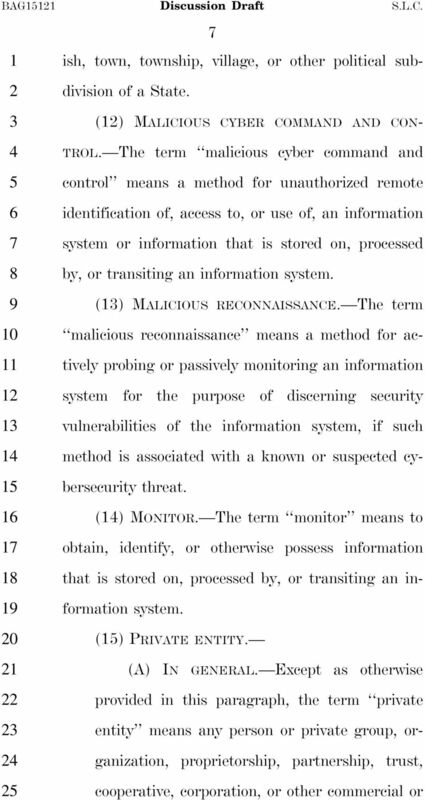 Nothing in this subsection shall be construed (A) to authorize the monitoring of an information system, or the use of any information obtained through such monitoring, other than as provided in this Act; or (B) to limit otherwise lawful activity. (b) AUTHORIZATION FOR OPERATION OF COUNTER- MEASURES. () IN GENERAL. 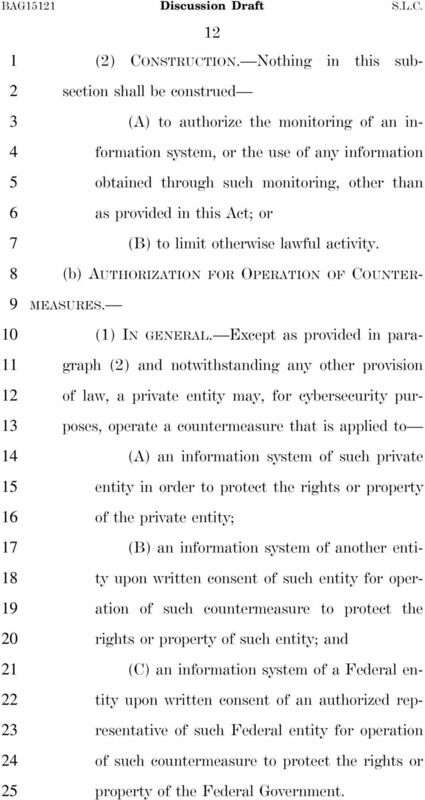 Except as provided in paragraph () and notwithstanding any other provision of law, a private entity may, for cybersecurity purposes, operate a countermeasure that is applied to (A) an information system of such private entity in order to protect the rights or property of the private entity; (B) an information system of another entity upon written consent of such entity for operation of such countermeasure to protect the rights or property of such entity; and (C) an information system of a Federal entity upon written consent of an authorized representative of such Federal entity for operation of such countermeasure to protect the rights or property of the Federal Government. 27 BAG Discussion Draft S.L.C. 0 0 (A) any entity may share cyber threat indicators and countermeasures through such process with the Federal Government; and (B) all of the appropriate Federal entities receive such cyber threat indicators and countermeasures in real time with receipt through the process within the Department of Homeland Security. () OTHER FEDERAL ENTITIES. 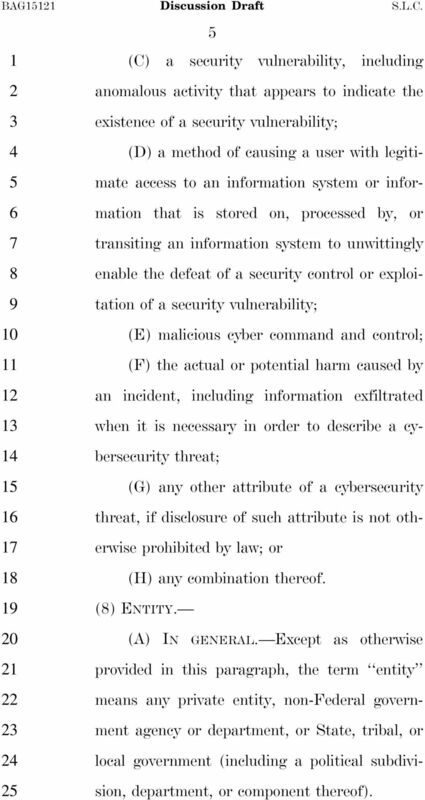 The process developed and implemented under paragraph () shall ensure that other Federal entities receive in a timely manner any cyber threat indicators and countermeasures shared with the Federal Government through such process. () REPORT ON DEVELOPMENT AND IMPLE- MENTATION. (A) IN GENERAL. 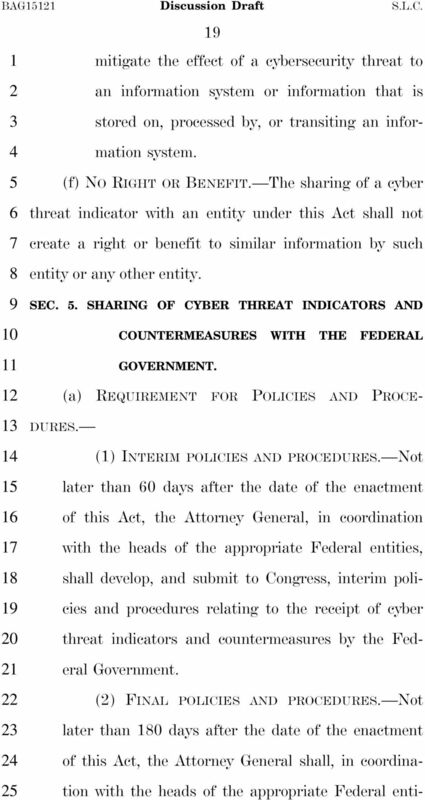 Not later than 0 days after the date of the enactment of this Act, the Secretary of Homeland Security shall submit to Congress a report on the development and implementation of the capability and process required by paragraph (), including a description of such capability and process and the public notice of, and access to, such process. 36 BAG Discussion Draft S.L.C. 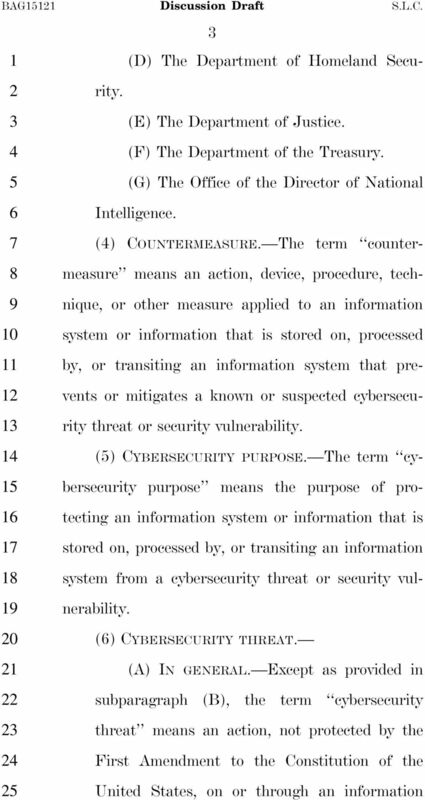 0 0 accounting of the number of security clearances authorized by the Federal Government for the purposes of this Act. 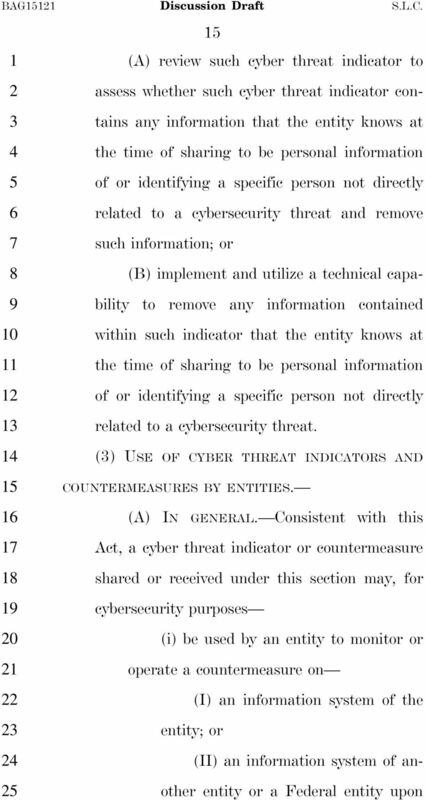 (E) A review of the type of cyber threat indicators shared with the Federal Government under this Act, including the following: (i) The degree to which such information may impact the privacy and civil liberties of specific persons. (ii) A quantitative and qualitative assessment of the impact of the sharing of such cyber threat indicators with the Federal Government on privacy and civil liberties of specific persons. (iii) The adequacy of any steps taken by the Federal Government to reduce such impact. 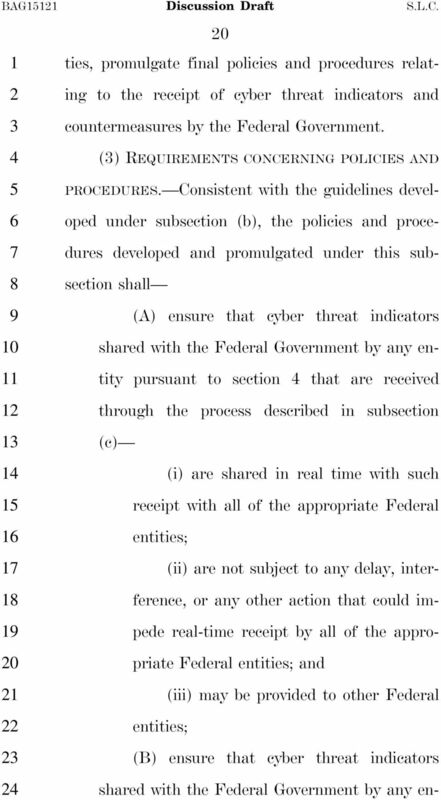 (F) A review of actions taken by the Federal Government based on cyber threat indicators shared with the Federal Government under this Act, including the appropriateness of any subsequent use or dissemination of such cyber threat indicators by a Federal entity under section. 38 BAG Discussion Draft S.L.C. 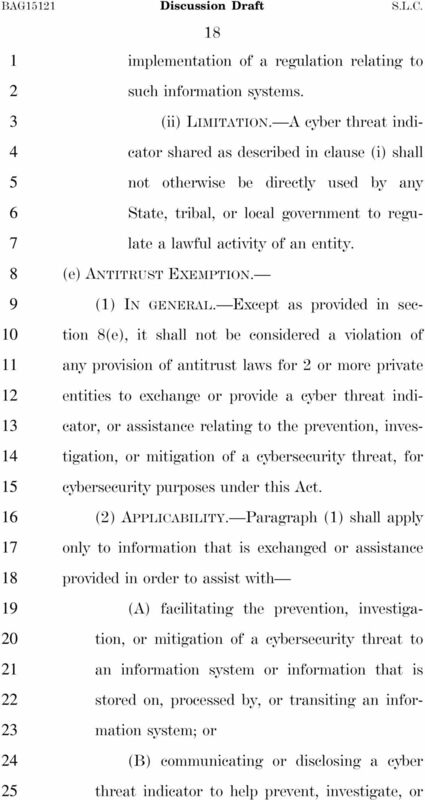 0 0 (A) an assessment of the privacy and civil liberties impact of the type of activities carried out under this Act; and (B) an assessment of the sufficiency of the policies, procedures, and guidelines established pursuant to section in addressing privacy and civil liberties concerns. () BIENNIAL REPORT OF INSPECTORS GEN- ERAL. (A) IN GENERAL. Not later than years after the date of the enactment of this Act and not less frequently than once every years thereafter, the Inspector General of the Department of Homeland Security, the Inspector General of the Intelligence Community, the Inspector General of the Department of Justice, the Inspector General of the Department of Defense shall, in consultation with the Council of Inspectors General on Financial Oversight, jointly submit to Congress a report on the receipt, use, and dissemination of cyber threat indicators and countermeasures that have been shared with Federal entities under this Act. 39 BAG Discussion Draft S.L.C. 0 0 (B) CONTENTS. 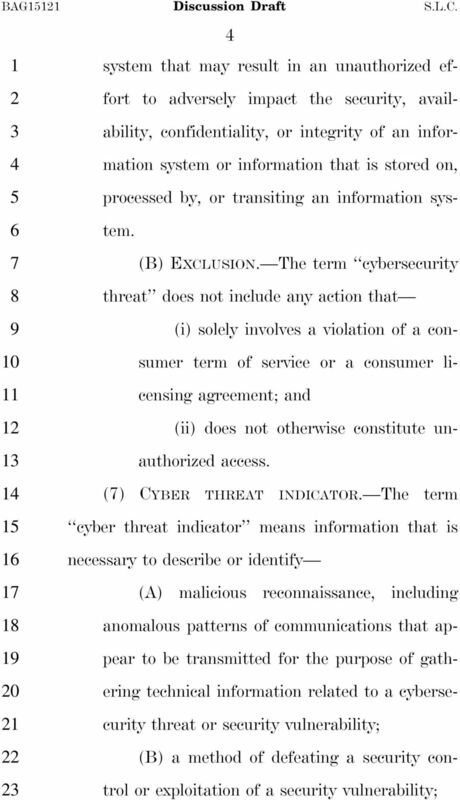 Each report submitted under subparagraph (A) shall include the following: (i) A review of the types of cyber threat indicators shared with Federal entities. (ii) A review of the actions taken by Federal entities as a result of the receipt of such cyber threat indicators. 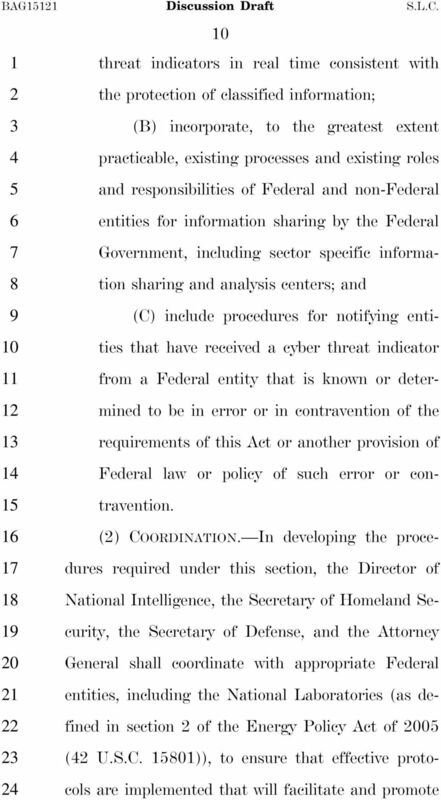 (iii) A list of Federal entities receiving such cyber threat indicators. (iv) A review of the sharing of such cyber threat indicators among Federal entities to identify inappropriate barriers to sharing information. () RECOMMENDATIONS. Each report submitted under this subsection may include such recommendations as the Privacy and Civil Liberties Oversight Board, with respect to a report submitted under paragraph (), or the Inspectors General referred to in paragraph ()(A), with respect to a report submitted under paragraph (), may have for improvements or modifications to the authorities under this Act. 44 BAG Discussion Draft S.L.C. 0 0 or other provision of law of a State or political subdivision of a State concerning the use of authorized law enforcement practices and procedures. (l) REGULATORY AUTHORITY. Nothing in this Act shall be construed () to authorize the promulgation of any regulations not specifically authorized by this Act; () to establish or limit any regulatory authority not specifically established or limited under this Act; or () to authorize regulatory actions that would duplicate or conflict with regulatory requirements, mandatory standards, or related processes under another provision of Federal law. (m) AUTHORITY OF SECRETARY OF DEFENSE TO RESPOND TO CYBER ATTACKS. Nothing in this Act shall be construed to limit the authority of the Secretary of Defense to develop, prepare, coordinate, or, when directed by the President to do so, conduct a military cyber operation in response to a cyber attack carried out against the United States or a United States person by a foreign government or an organization sponsored by a foreign government. 48 BAG Discussion Draft S.L.C. 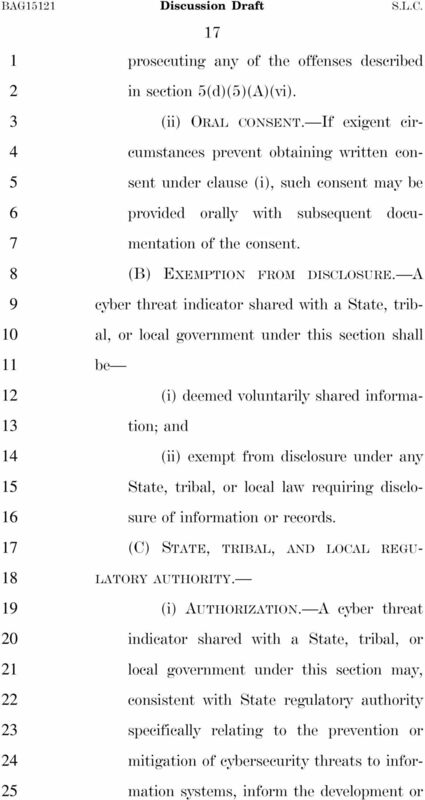 promulgated by the Attorney General under section of the Cybersecurity Information Sharing Act of 0..
S. 754. To improve cybersecurity in the United States through enhanced sharing of information about cybersecurity threats, and for other purposes. Public Law 103-62. 103rd Congress -- 1st Session [S. 20] 103 P.L. 62; 107 Stat. 285 1993 Enacted S. 20; 103 Enacted S. 20 DATE: AUG.
H. R. To amend titles 17 and 18, United States Code, to strengthen the protection of intellectual property, and for other purposes. CHAPTER 116. C.12A:12-1 Short title. 1. This act shall be known and may be cited as the "Uniform Electronic Transactions Act." FedRAMP Package Access Request Form For Review of FedRAMP Security Package INSTRUCTIONS: 1. Please complete this form, then print and sign. 2. Distribute to your Government Supervisor for review and signature.